Item shown above : Oak finish with a low gloss protective lacquer coating. (Trains are not included). Beautifully crafted display case for N an Z scale trains display. 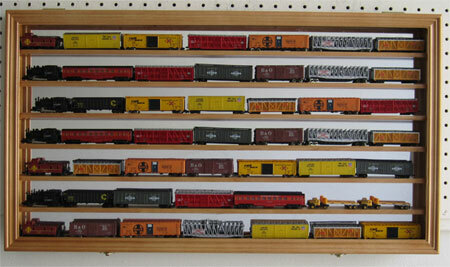 A prefect way to display and organize your small scale trains. Wooden shelves for a very elegant presentation. Installed wall brackets on the back to hang. This case can display N and Z scale/gauge trains, Kids wooden trains, Thomas Trains and etc, etc. The mirror backing provide excellent contrast appearance. The glass door keeps dust and inquisitive fingers off. (Trains are not included). Inside Depth::1.25"D Space between Rows: 1.25"